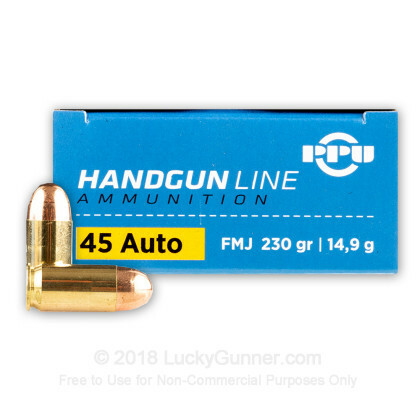 Newly manufactured by Prvi Partizan, this 45 Auto ammo is great for training with your 1911 or other 45 ACP chambered pistol. This ammo is loaded at Prvi Partizan's plant located in SW Serbia. 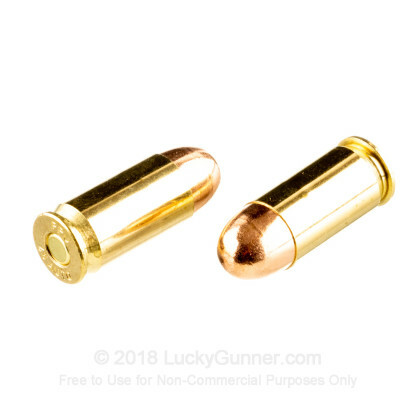 This ammo is brass-cased, Boxer-primed, non-corrosive, and loaded in reloadable casings. Lucky Gunner has the best shipping and customer service -- hands down. The Prvi Parizan 45 ACP. No failure through 400 rounds. I did find them to be a little dirty but not to the point I would not use them again. 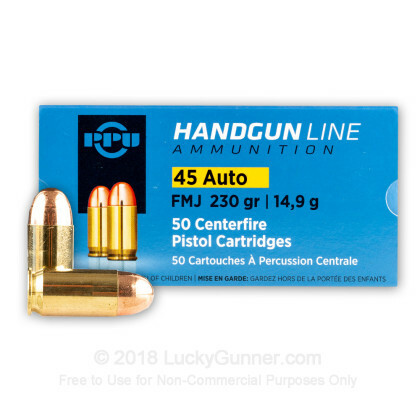 Great range ammo. Tight groups. A little dirty but very acceptable. Had 1 failure (light strike). Clearly had a good strike on the primer. It fired fine on the second strike. Would definitely buy it again for the range. As always, Lucky Gunner was great. Arrived perfectly in 2 days. ACP 230gr and it works great for my 1911. For money's worth, Will purchase more later in future.! Prvi Partizan lives up to its rep. Also use the 5.56 nato in my Sig M400. Well worth the price. No issues or malfunctions. 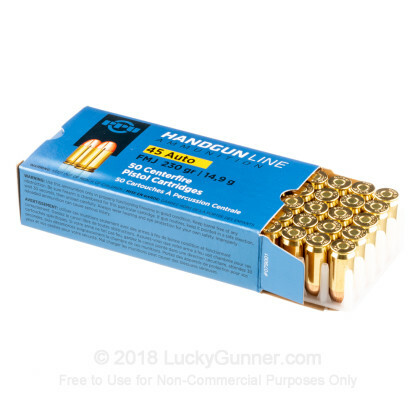 Great Ammo, good price. I am very happy with the performance of these rounds. clean, consistent, and agood buy. No problems with cleanliness, shoots awesom groups, and wasn't too costly for range use. I'd buy again when they hit the sale floor. I always get this ammo for my Kimber 1911. 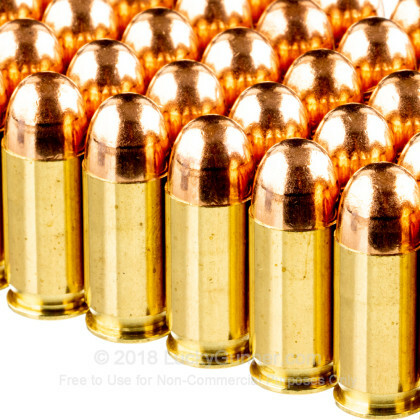 I have shot over 2000 rounds of this ammo in my Kimber with not one problem. I just love the e-mails Luckygunner sends me out to let me know what they've got on special. This time was PPU .45ACP ammo. Its like they are reading my mind! Just what I needed, at a price I couldn't pass up. Ordered it on Tuesday, and got it on Friday. For me it was a nice deal, with fast service! Thanks again Lucky! Clean burning, excellent accuracy! Price can't be beat for the quality of this round. So far, 250 rounds without a hitch! My Les Baer TR 5" loves this stuff! What a good price!! Finally got enough 45 acp, for now!! Shooting in a Ruger Blackhawk convertible revolver and a Colt 1911. Both guns love this stuff. Fast service. I did have 2 jams in my Sig Sauer 220, but my 1911 had no problems and the accuracy was fine. Good quality, not dirty. No hiccups on my Sig P220. I have been using PPU ammo extensively in my 1911, and it has been consistently reliable and accurate. 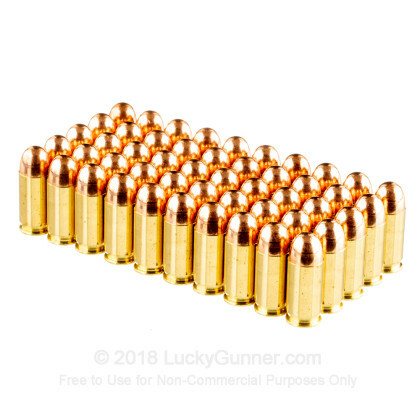 We also have this 45 ACP - 230 Grain FMC - Prvi Partizan - 50 Rounds ammo in stock in a smaller quantity.